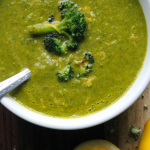 This Lemon Broccoli Soup is creamy, healthy & hearty soup that's keto diet friendly, made with onion, garlic, vegetable broth, lemon juice and lots of broccoli. Heat oil in a large pot over medium heat; once the oil is hot, reduce heat to low. Cook and stir onion and garlic in hot oil until softened, 3 to 5 minutes. Add broccoli, season with salt and pepper, and stir. Pour vegetable broth and lemon juice into the pot. Loosely cover the pot and simmer the mixture until the broccoli is tender, about 25 minutes. Puree with an immersion blender until smooth. Garnish with Cheddar cheese to serve.